Forge Recirc valve for R55, R56, R57, R58, R59, R60, R61 MINI Cooper S turbo with N18 engine, this is also commonly referred to as a blow off valve even though the boost is not vented externally. This Forge recirc valve alternative is a fully engineered solution offering both significantly improved reliability as well as valve related boost response. The Forge valve and installation kit replaces the original unit with a pressure/vacuum operated piston valve that still also retains the desirable OEM ECU control over valve actuation. This product has been thoroughly designed and tested with the expressed intent of offering improved valve response and maintaining ECU control while resulting in absolutely NO fault codes, NO check engine lights, and no adverse effects of any kind. All of the necessary components and detailed instructions are included and everything is designed to make installation as simple as possible. Simply put this valve will improve throttle response and boost control to enhance the driveability and performance of your MINI. 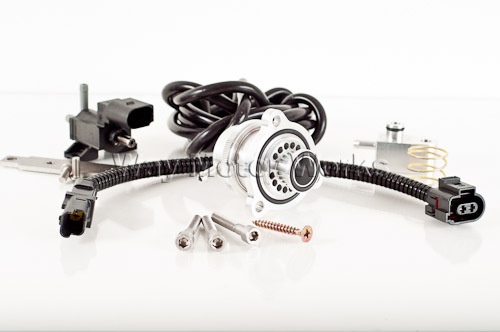 This kit is supplied with an additional upgraded spring that may be required if the vehicle has had a significant boost increase. Excellent product from forge! The biggest difference that you will notice from installing this is the noise it makes. If you like the stock woosh noise...this product is not for you. Best way to describe the noise is a chu chu chu noise. I found a YouTube video that makes the exact same noise, when installed on the MINI.